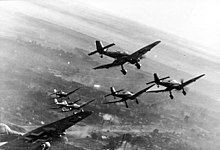 The Junkers Ju 87 or Stuka (from Sturzkampfflugzeug, "dive bomber") was a German dive bomber and ground-attack aircraft. Designed by Hermann Pohlmann, it first flew in 1935. 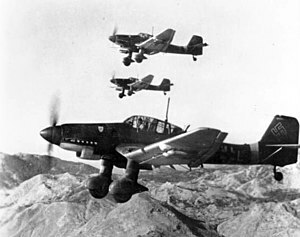 The Ju 87 made its combat debut in 1937 with the Luftwaffe's Condor Legion during the Spanish Civil War and served the Axis forces in World War II. The aircraft was easily recognisable by its inverted gull wings and fixed spatted undercarriage. Upon the leading edges of its faired main gear legs were mounted the Jericho-Trompete (Jericho trumpet) wailing sirens, becoming the propaganda symbol of German air power and the so-called blitzkrieg victories of 1939–1942. 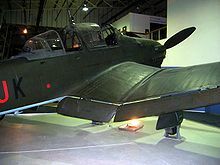 The Stuka's design included several innovations, including automatic pull-up dive brakes under both wings to ensure that the aircraft recovered from its attack dive even if the pilot blacked out from the high g-forces. ↑ "Luftwaffe aircraft production March 1944." Archived 28 September 2007 at the Wayback Machine luftwaffe.no. Retrieved: 12 November 2010. ↑ Bono, Ferran (2018-05-02). "Las mortíferas pruebas de los 'stukas' de Castellón". El País (in Spanish). ISSN 1134-6582. Retrieved 2018-05-03. ↑ Bergström 2007 (Barbarossa title), p. 69. ↑ Bergström 2007 (Barbarossa title), p. 85. ↑ Bergström 2007 (Barbarossa title), p. 119. ↑ Bergström 2007 (Kursk title), p. 118. 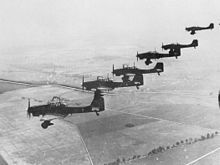 ↑ "The Stuka Stealers". Aeroplane, February 2009, pp. 14–18. 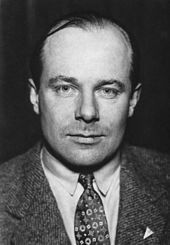 1 2 Bert, Hartmann. "Das Archiv der Deutschen Luftwaffe". www.luftarchiv.de. ↑ "FHCAM – Home". Flyingheritage.org. Retrieved 2018-09-20. 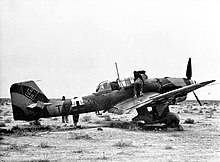 ↑ "Ju-87-Bergung – Der mysteriöse Stuka-Code". Flugzeug Classic (in German). GeraMond Verlag GmbH. Retrieved 29 November 2016. ↑ "Hellenic Aviation News." Archived 17 July 2007 at the Wayback Machine koti.welho.com. Retrieved: 1 September 2010. 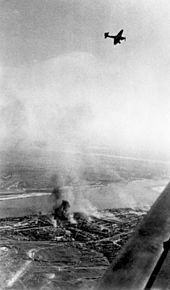 ↑ "Odnaleziono wrak bombowca sprzed 71 lat. W jego wnętrzu znajdowały się szczątki pilota". onet.rzeszow (in Polish). Grupa Onet.pl S.A. 12 November 2015. Retrieved 29 November 2016.